A day tour around Mt. 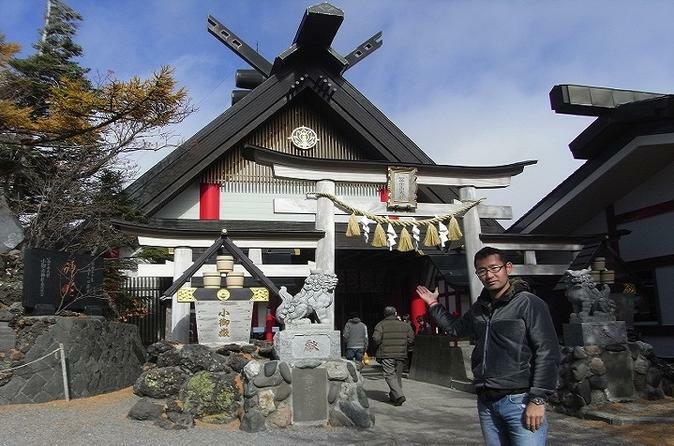 Fuji, its nearby sites and shopping at the Gotemba Premium Outlet, Japans largest outlet mall. As this car service tour on the mini-van is completely yours, we are very flexible to customize it if you have any request. If you wish we can end the day in an onsen (hot spring) like we Japanese do at end of a long journey. The guides that we afford are English, French, Chinese and Korean speaking guide all having their national qualification so please request your preferred language when you reserve. We’ll be meeting up at your requested location and head toward Mt Fuji. Once we arrive at the area, we will be driving up to the Mt Fuji Fifth Station, 2,300 meters (7546 feet) high above sea level. The highest point we can drive up to, and for climbers during the season. Please note that access to the 5th station will be closed between the second week of July to the first week of September due to climbing regulation, and limited during snow season usually from mid November up to mid March. As information is given, we still can try to see how far we can go during the winter but not really recommended. Don’t worry because we do have alternatives for all seasons. After lunch, we'll be heading to the Gotemba Premium Outlet, the largest outlet shopping mall of Japan. You'll be able to find here a total of 225 shops to find your own items and gifts for yourself, your family and your friends. If you wish we can take you to an onsen, Japanese hot spring to relax after a long day of touring and shopping. You'll be dipping and relaxing in the hot springs before we head back to Tokyo. Tell us where you wish to be dropped off.